Don’t have all your camping gear yet? Our campsite partner this year is Fat Frank’s Camping Store, so if you don’t want to tow it all with you, order online and collect it from Fat Frank’s stall in the Midgard campsite. They’ll even blow up your air bed while you wait for a couple of quid. See what’s available and/or place your order via their ‘click & collect’ service here - http://fatfrankscampingshop.com/. If you arrive and discover you’ve forgotten something essential, Fat Frank’s will do their best to help! On Monday morning, if you can’t be bothered drag your tent home, don’t just leave it behind, help out by taking it to Fat Frank’s and they’ll donate it to charity. There’s a wide range of food on offer at BLOODSTOCK, so whether you’re carnivore, vegetarian, vegan or gluten-free, you’re sure to find something that takes your fancy. This year you could be tucking into all sorts of burgers, pizza, tacos, jacket potatoes, Belgian waffles, smoked meats, chicken, ostrich (get the Jack Daniels onions to go with...), pie & mash (mushy peas optional), giant Yorkshire puds, gourmet ravioli, burritos, quesadillas, chips (including curly and sweet potato fries), mac n’ cheese (even in a wrap! The ultimate hangover carb-fest), cakes, nachos, hot dogs, paella, not to mention bunnychow (steak or vegan chilli in a hollowed-out loaf, with a garlic bread dipper). Wash it all down with Motley Brew’s teas, a milkshake from Shaken Udder, all types of coffee, a hot choc with all the trimmings (see the Waffle folks), or a chilled pint from Lemmy’s Bar! There’s also free drinking water at designated water points in the campsites and main arena. Pick up other essentials at the on site 24-hr supermarket. You can even get a massage to go with your cuppa at Theatre of Pain, if you’ve overdone the headbanging. Learn more at: http://www.bloodstock.uk.com/events/boa-2018/traders. 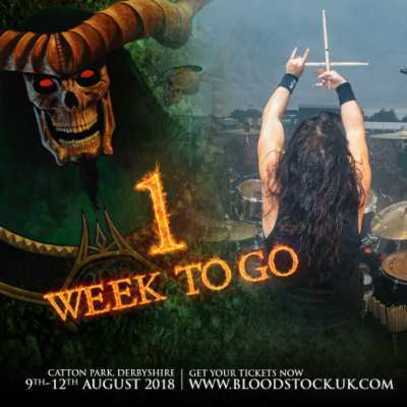 BLOODSTOCK takes place at Catton Park, Derbyshire on 9th-12th August 2018.